The San Francisco Carbon Fund is the first fund of its kind to invest solely in local projects that reduce greenhouse gas emissions close to where they were created – rather than large scale offset projects across the globe. Like other mitigation programs, the San Francisco Carbon Fund uses widely accepted protocols to estimate carbon savings. It also delivers other environmental benefits such as creating a greener and more walkable city. The San Francisco Carbon Fund's impact can be seen and felt by the community daily. The San Francisco Carbon Fund provides an opportunity to mitigate event-related greenhouse gas emissions by investing in projects within the City and County of San Francisco. How much should a conference spend on mitigation? No strict rules dictate how much a conference should spend on mitigation. Some have calculated the amount based on the emissions generated by attendees’ air travel. Others chose a flat rate based on conference budget. San Francisco’s local government believes so strongly in the Fund it invests approximately 13% of employee airfare related to city business. Do the funds get used by one project or many? 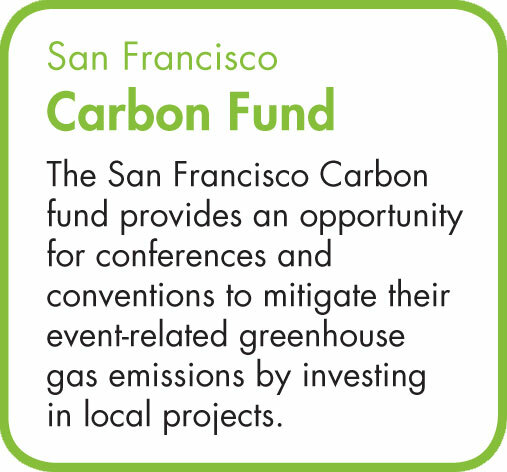 The San Francisco Carbon Fund provides funding to a range of projects. Depending on how much you want to mitigate, your investment can be represented by an entire project, or combined with others to proportionally supply a project. To find out how you can get involved in the SF Carbon Fund please email [email protected]. Mitigate your impact, leave a legacy. AsianWeek Foundation will partner with Quesada Gardens to create the Asian Community Green Space Project in Bayview Hunters Point. The project will return extremely hard-packed soil to a permeable state, remove invasive plant species, install smart water capture and reuse features, and introduce an edible garden and landscaping that prioritizes native plant species. It will reduce carbon emissions and storm-water runoff. Co-benefits include providing community gathering space, growing food, and engaging low-income, underserved immigrant Asian populations that are currently disconnected from the movement to green the urban environment. Commodore Sloat Elementary School will reduce the asphalt surface area of play yards on the school campus and create additional green space at Ocean Ave and Junipero Serra streets. This project will sequester carbon and reduce stormwater runoff. Co-benefits include: creating a tree stewardship program integrated with the existing gardening program, expanding the experiential component of the school curriculum in the areas of science and language arts, increasing outreach to the neighborhood community by increasing the use of the outdoor school space during non-school hours. Friends of the Urban Forest will create permeable surfaces through the installation of sidewalk gardens and planting trees along public rights-of-way throughout the city. Projects will sequester carbon and reduce storm-water runoff by replacing concrete with climate-appropriate, drought-resistant vegetation. All projects will involve the participation of local households, small businesses owners, public schools and other City agencies. Co-benefits include improving neighborhood walkability and building community, as well as providing workforce development opportunities for San Francisco youth. Gateway High School at Geary Boulevard and Scott Street will replace a portion of the school's paved parking area to mitigate stormwater runoff. Co-benefits include youth employment to maintain the project. Grant funds will be used to leverage support for the next phase of the project—planting a community garden. Golden Gate Audubon Society will plant native coastal scrub plants and grasses to create a naturalistic sediment contour in the upland at Pier 94 in Bayview Hunters Point to sequester carbon and reduce runoff. Co-benefits include providing nesting and foraging habitat for upland birds and other animals, providing educational programming for local school groups, and providing a quiet natural location in the middle of the bustling city. Nature in the City will convert weedy and ice plant-covered public sites along 14th Avenue between Kirkham and Santiago Streets into restored upland dune habitats to retain water and sequester carbon. The project will also prevent erosion and stabilize sandy slopes. Co-benefits include connecting two isolated populations of the locally threatened Green Hairstreak butterfly, expanding the Backyard Native Nursery Network, and increasing eco-literacy and community support. Ney Street Neighborhood Watch will plant large shrubs on strip of barren, rock solid, garbage strewn land on the 700 block of Alemany Boulevard. This project will reduce carbon emissions and storm-water runoff. Co-benefits include improving the beauty and safety of the Alemany bike lane, improving neighborhood walkability and mitigating sound and air pollution from Allemany Boulevard. San Francisco Parks Alliance will create and complete additional urban park areas throughout the city. Projects will reduce carbon emissions and stormwater runoff. Co-benefits include improving neighborhood walkability and providing green community space for residents to gather.